Local Mission Projects - There is Room for Everybody. This is the eighth year that EPC has made a commitment to partner with North Decatur UMC and the MLK, Jr. Service Project to help repair, maintain, and provide greater efficiency and quality of life for low income seniors. Through our Fall BBQ & Bluegrass Festival, we typically raise around $500 to defray the expense of these projects, and we provide volunteers along with North Decatur United Methodist Church. Yard projects for youth and adults include weeding, trimming bushes, and raking leaves. There are plenty of small projects that one or two people can tackle in a short period of time, including sheet rock repair and replacing screen on the porches. * Sign up to volunteer for one or several shifts over the MLK weekend: Saturday morning and afternoon, Sunday afternoon, and Monday morning and afternoon. Please keep in mind that we have the most volunteers on Saturday morning. You are likely to find another shift to be less crowded and our leadership less stressed! * Make cookies or brownies for the teams of volunteers. * Be a prayer warrior – lifting up our low-income seniors, our volunteers, and the Project leadership. Contact the church office for more information and/or to be put in touch with our volunteer coordinator. We hope you will join us for next year’s project! Sometimes families find themselves spending days or weeks at a child’s hospital bedside. At the request of the social work department at Children’s Healthcare of Atlanta, we are making meal bags for parents who cannot afford to buy meals during their child’s hospitalization. They give out 20-40 meal bags a day, so at least 100 a week or 400 a month. How can you help? Bring non-perishable individually-packaged food for a meal bag. If you prefer, you can give money and the needed food will be purchased. You can bring the food in bulk and place it in the back of the sanctuary. The supplies will be available in the Prayer Room in the fellowship hall for anyone who would like to assemble a meal bag and pray for the family the meal will nourish. Or you can create meal bags at home yourself. EPC member Lillian recommends her daily Lenten practice: make a meal bag, pray for the family it will serve, and give thanks for your own health and the health of those you love. 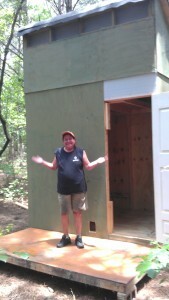 Every Spring, we host a Mad Housers build to provide a simple but sturdy shelter for a homeless person in our community. Each hut becomes the living space for someone who was previously living outdoors, giving them shelter from weather and a place to store their belongings and sleep in safety. The EPC Mission Team works with Clifton Sanctuary Ministries’ shelter for men. We gather a small group (5 or 6) people to volunteer periodically to prepare and/or serve a hearty dinner to the men there. The meal is prepared offsite and brought to Clifton. The meals are low sodium and include no pork, but typically include a meat, a vegetable, bread, a dessert, and drink. Food is prepared to serve 30 people. Those in need are referred by the following agencies: DEAM 770-373-2300; DFAC, 404-370-5000; United Way, 211; Partnership for Community Action, 404-929-2500. For information on receiving assistance, contact one of these agencies. We partner with Trinity Presbyterian Church (Decatur) to provide gently-used clothes for their clothes closet. Drop off bags of clean clothes at the church office. Please keep the bags to a medium weight (not the large contractor size) so they can be wrestled up and down stairs and into a car for delivery to Trinity. Drop your loose change into the change jar at the back of the church. Every three months we roll it, count it, and donate it to a ministry which will use it to make a positive change in the world. Previous recipients have included the Decatur Cooperative Ministry to help prevent homelessness locally, the Medical Benevolence Foundation for relief in Haiti, and Ministry of Insured Salvation, an orphanage in Lesotho which we’re connected to through our PCUSA missionaries, the Dimmocks.